__author__ = "Rui Barbosa Martins (ruibmartins@gmail.com)"
usage = "Usage: %prog [Options] FILE_OR_DIRECTORY"
print "Error: Too many paths provided. Only one expected." 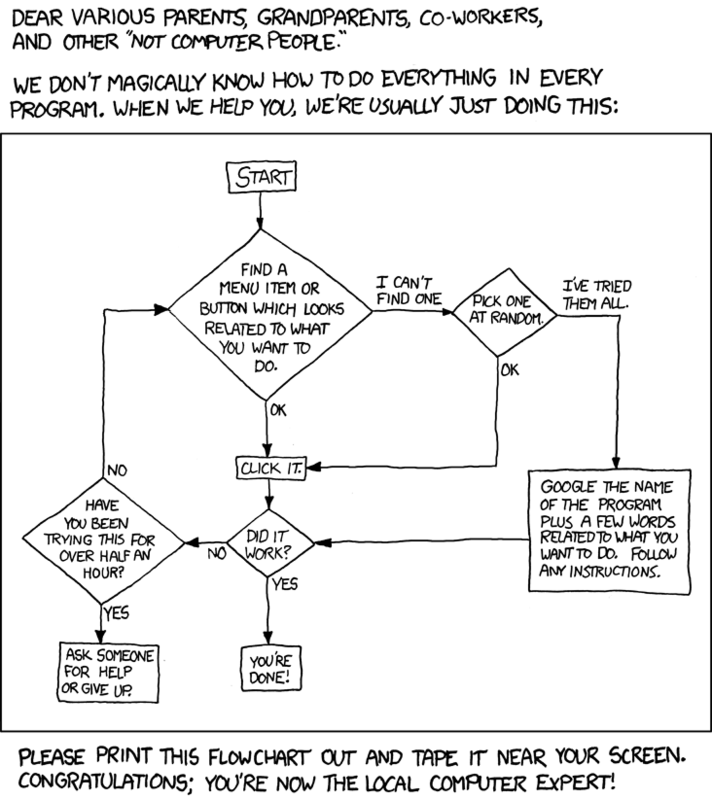 Há uns tempos atrás o venerável jovem do xkcd teve um rasgo de brilhantismo ao descrever no post abaixo a típica situação pela qual o comum informático passa vezes sem conta. 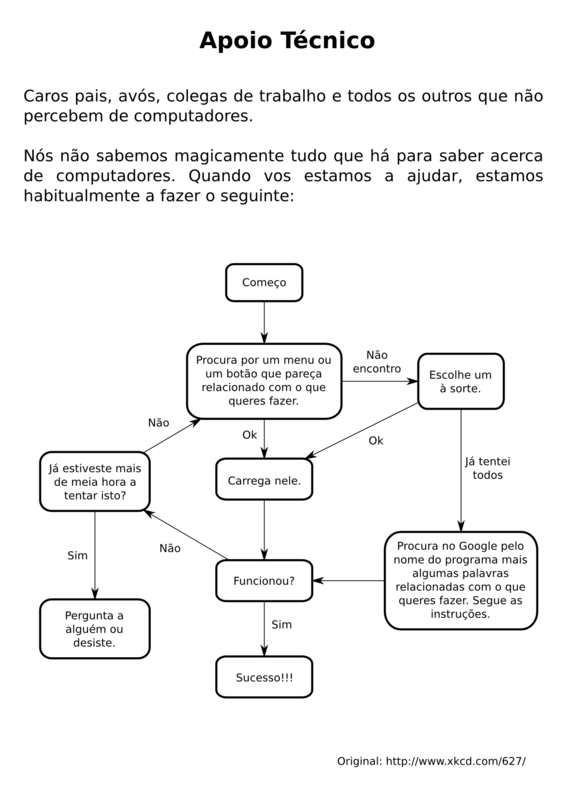 Como achei que era uma perda enorme tão bom diagrama não chegar à comunidade não informática portuguesa, onde o diagrama seria claramente mais útil resolvi traduzi-lo para Português. Aqui vai o link para uma imagem com resolução aceitável para imprimirem e colocarem na parede do vosso escritório. For the past two weeks the weather in London has been simply amazing. Last weekend was the culmination of it all. Went for a leisurely stroll around Kensington and behold the scenery I contemplated at Holland Park! And to improve it even further the clear blue sky was even clearer than usual due to this flight ban. Well, I’m pretty sure the airlines are doing what they can to get flights up and running again, and it is obviously better not to fly than to have some “flight incidents”. Fingers crossed and maybe I’ll find out tomorrow that this new ash cloud is being blown away towards the US or maybe Greenland. Ah, almost forgot, out of irony one of the few flights taking off from London today, guess where it went?? That’s it, Reykjavik… maybe the UK just sent a few technicians to cover up the hole and be done with this ordeal. Finally, after almost a year battling away with wxWidgets, GraphicsMagick, gcc, Visual Studio, CppUnitLite, … I finally get to release version 1.0.0 of SimplePhoto. 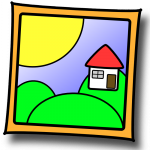 SimplePhoto is a batch processing application for images. For the time being it allows image format, image dimensions and groupings. My main focus for this application was to make it’s memory footprint as little as possible. It’s been implemented in C++ and on Windows it takes around 5MB of memory when running. There are still loads of features to implement but I really wanted to get this out there ASAP. Next step is to open source it (probably hosting it at code.google.com). After a lot of frustration I decided that the best way to have GraphicsMagick/ImageMagick finding the required magic.mgk file inside YourApp.app/Contents/Resources is to patch the image library code. The change is quite trivial and I’ve pasted the diff below. This patch was applied to GraphicsMagick version 1.3.7. Basically it uses the path provided via magick::InitializeMagick(“executable/path”) to find Contents/Resources. Have fun!!! Lately I’ve been battling away with the Mach-O binary file format. I am trying to create a Mac version of an application that depends on dylibs provided by wxWidgets and GraphicsMagick. I started this quest by finding out the hard way that mac binaries (libs and applications) store the path to their dylib dependencies in the binary itself. As you can imagine this is a big hassle for app deployment as you force every user wanting to install the app to have the same exact /usr/lib and /opt/local/lib as your machines does. After a bit of scavenging in forums I found out that otool allows you to print the list of dependencies of a binary and that install_name_tool allows you to change them. Bearing this in mind I now wanted the simplest way I could get to change the list of dependencies both in my binary and inside all of its dependency dylibs. I ended up writing the python script below for this. # dylib dependencies to another (hopefully relative) path to ease deployment. # If this is applied to dylib files it will also change their ID. Since I spent quite a few hours trying to get my first OpenGL ES triangle on the Android phone’s screen I thought I should share the code with everyone to ease a bit the pain. Hopefully this will help someone get going on Android. // Disable a few things we are not going to use. // Set our field of view. // Position the camera at (0, 0, -2) looking down the -z axis.